St. Edith (961-984) was the daughter of the King of England, St. Edgar (943-975); she was therefore brought up at the royal nunnery at Wilton (in Wiltshire, between Newbury and Devizes), where she was taught not only to read, but also writing and illumination, sewing and embroidery. She died a virgin aged only 23. 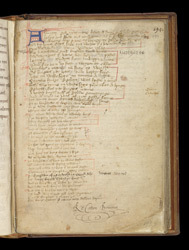 She was venerated mainly at Wilton, which suggests that this manuscript comes from there. This is the first page; it begins: 'Almighty God in Trinity, Father and Son and Holy Ghost / Help and speed and counsel me . . .' (spelling modernised). In the lower margin is the signature of Sir Robert Cotton, whose collection of manuscripts formed one of the major parts of the British Library's collection when it was founded in 1753.